If that constant boxing adage, “a happy fighter is a dangerous fighter” is true, then Adrian Broner and the rest of boxing’s welterweight division may be facing a very dangerous Manny Pacquiao. And these days, Manny Pacquiao has many reasons to be happy going into the ring at the MGM Grand in Las Vegas tonight (SHOWTIME, PPV 9 p.m. ET). It has been a fun media week and we have seen a lighter side to Pacquiao than in previous fights. There was a joyful air of reunion last week in Los Angeles at the media workout at Wild Card Gym where he hugged Freddie Roach and goofed it up, throwing fake jabs at trainer and boyhood friend Buboy Fernandez. There were the hilarious Saturday Night Live-like skits played out on social media with comedian Michael Blackson. (look up @michealblackson on the Gram, it’s brilliant). In each skit, already with over 650,000 views, Blackson acts as translator to Manny’s very polite responses to reporter questions. When asked his predictions for the fight, Pacquiao replies, “I’m not predicting the fight but I will do my best” and Blackson translates, “What he (Manny) really means to say is, man that’s some bullsh–, he’s gonna really f— this boy up…” Blackson goes on and on while Manny smiles sheepishly alongside him. And a joyful Manny, even up until yesterday’s weigh in as Manny tries to muster seriousness at face off, a smile breaks and he pats Broner on his bum as they turn around. We have a very happy, relaxed PacMan today. And why not? Pacquiao, at 40 years old, in the 70th bout of his storied professional career, coming off a convincing TKO against Lucas Matthysse to regain the WBA welterweight title once more and comfortably settling into the welterweight division… PacMan, who will reportedly earn upwards of 20 million in purse money and marketing profits tonight, his first fight with new promoter Al Haymon and PBC.. Manny, who launched his career in 1995, when Broner and his welterweight peers were in preschool, motivated perhaps to show the young lions who is king, and still.. To many Filipinos, he is the People’s Champ, the boy who grew up in extreme poverty who is a living world boxing legend and two term congressman in the Philippines, and since 2016, Senator Pacquiao, whose boxing wins only add to fuel his political ambition..
No one knows Pacquiao better than his inner circle, his coaches and friends, Freddie Roach, Buboy Fernandez and Justin Fortune who are often candid about their assessment of their fighters. Fortune and Roach have said Pacquiao may have overtrained for the Horn fight, and adjustments were made to Pacquiao’s training; they have taken a more conservative approach to fight camp; a concerted effort to increase Manny’s recovery time. Results of that change showed clearly in the subsequent win over Matthysse. All three have said to this writer, that it is Pacquiao, whose drive to train relentlessly, often has to be tempered. I asked Manny why he has been able to stay in top shape his entire 23 year career and rest was not included in his answer. “I would like to thank God for this good health. 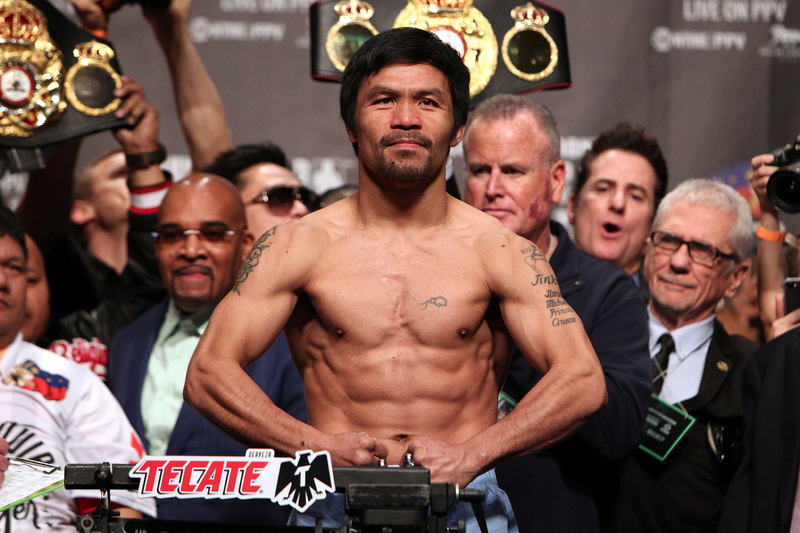 Basically its discipline, real discipline and hard work, that’s the most important thing,” said Pacquiao. “He knows he needs rest but it’s very hard for him to accept it,” says Roach. Nonetheless, when asked what elements of Manny’s skill has he retained over time, Fortune replied, “All of them. Speed, power, footwork – hasn’t stopped, that’s why he is still where he is at 40. He’s ridiculously fast on his feet, still fast, still strong on his hands.” Manny thanks God, his trainers thank Rest. It’s always a negotiation. With maturity often comes wisdom and perhaps Pacquiao has allowed himself to continue to do what he loves to do, which is to fight and help his countrymen. Those two goals are sincere,indisputable and linked. Pacquiao has proven time and again his good intentions for his people. He has gone beyond handing out hard cash to Filipinos (which he still does apparently) to serving public office and advancing a more change for his country. And now he has found a way in to stay in the boxing world beyond his career by launching his own namesake boxing promotions company MP Promotions. Someday, a long, long time from now, Manny hopes to see himself among the young stable of Filipino fighters he is grooming. Why is Manny Pacquiao so happy? Because he sees the end game. And what a happy place it can be. 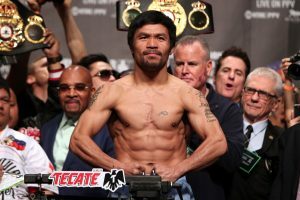 The post A Happy Manny Pacquiao is a Dangerous Manny Pacquiao appeared first on BoxingInsider.com.